For those who are studying for their PRINCE2 exam this is a nice and simple aid to support their study. Add some missing Management Products: Issue Report (from CS4 Capture and Examine Issues and Risks to CS5 Review Stage Status), include Project Product Description and Business Case as part of PB and PID and add Product Descriptions to the different plans. Lessons Report could be added to the End Stage/Project Report. If you add Management Strategies to the PID you are complete. I would also give a try to eliminate those process activities, which are mentioned more than once. E.g. DP5 is showed 3 times, but I could also see that it helps to understand the flow. You could add End Stage Report to the output of white box SB. Divide SU in two steps. One step to create the Project Brief and another step to create the Initiation Stage Plan. If there is no viable outline Business Case it doesn’t make sense to create the Initiation Stage Plan. 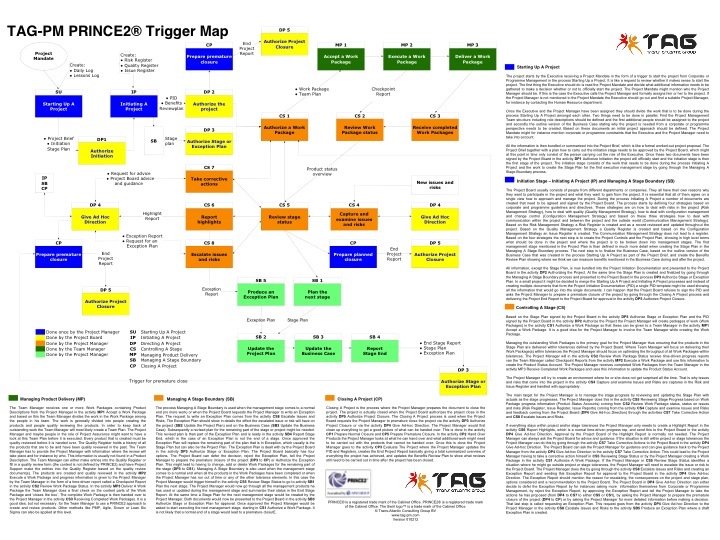 Because this is a trigger map I would suggest to add the formal PRINCE2 triggers/events to the map as well. E.g. the requests to, the notifications, the recommendations, etc. The QRC’s for delivering (Team Manager), Directing (Project Board members) and Managing (Project Manager) gives you a double-sided A4 (or triple fold) card with a lot of text. I am not arguing the content but I would like to see more pictures. The cards describe the roles and responsibilities and the major tasks within the project life cycle. 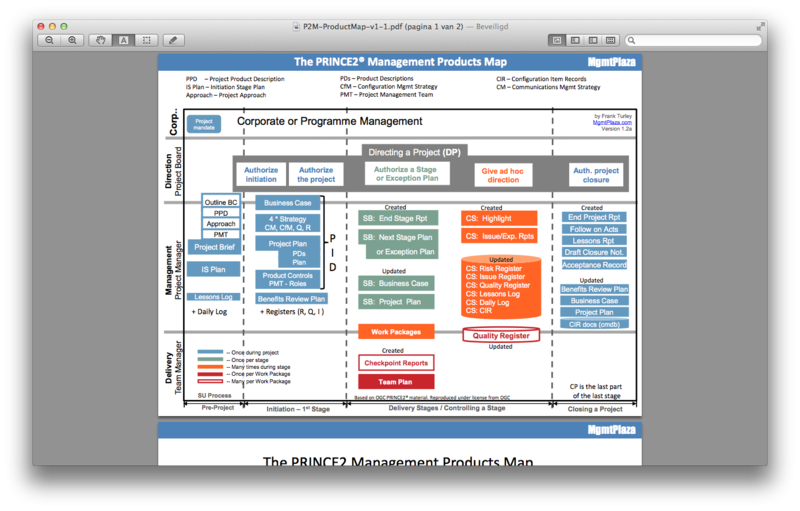 The Product Breakdown Structure of the PRINCE2 Management Products is what I call a picture. It gives all Management Products you have to create during a specific stage. I miss the Project Product Description as part of the PID and Product descriptions are also lacking. I would say that you could go further with presenting Management products and processes. 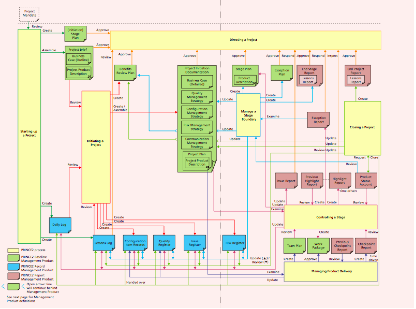 If you look at my PRINCE2 Product model (as part of my PRINCE2 Quick Reference Card) you get a complete picture where which product has been created and where it will be updated or used. Besides the QRC you will also receive the breakdown in a spreadsheet or Microsoft Project format. 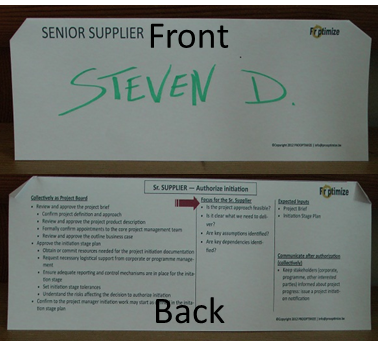 There are also three nametags to be used for the Project Board members when the meeting has to authorize initiation. One the front side you can write your name and on the backside you can read your own focus points and some collective roles and responsibilities for the Project Board as a whole. I nice idea to give those name tags an extra function. Finally you could also buy post-its to be used in workshops where you are going to define the Product Breakdown Structure. It will help you, in an effective and pragmatic way, to collect some basis product information (e.g. product name, purpose, composition and quality criteria. If you want to spend the money is up to you. Personally I think it’s a lot of money for the QRCs, especially if you look what other (free) PRINCE2 QRCs or PRINCE2 Apps are offering. The nametags are a great idea and these are for free. Also if you run scoping workshops the Post-Its can be of help but are rather expensive. As we all know a picture is worth a thousand words. 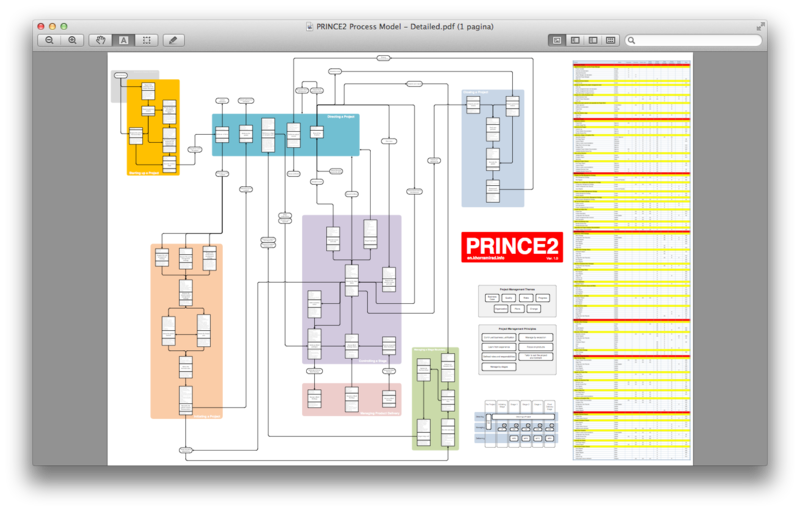 Many organizations or individuals created maps to visualize the PRINCE2 process and/or management products. These pictures are helpful during your study for the PRINCE2 Foundation or Practitioner exam, and for reference during day-to-day work as a project manager. In this blog I will show you some and I will give you my comments. Starting point will be PRINCE2 2009, although there are some nice pictures, e.g. the PRINCE2 2005 Tube Map from Mike Spain and the Crazy colour cards but they were never transformed into the 2009 version. Although the Crazy colour card for Project Boards is still valuable. • PRINCE2 uses 4 management levels: Corporate or programme, directing, managing and delivering. 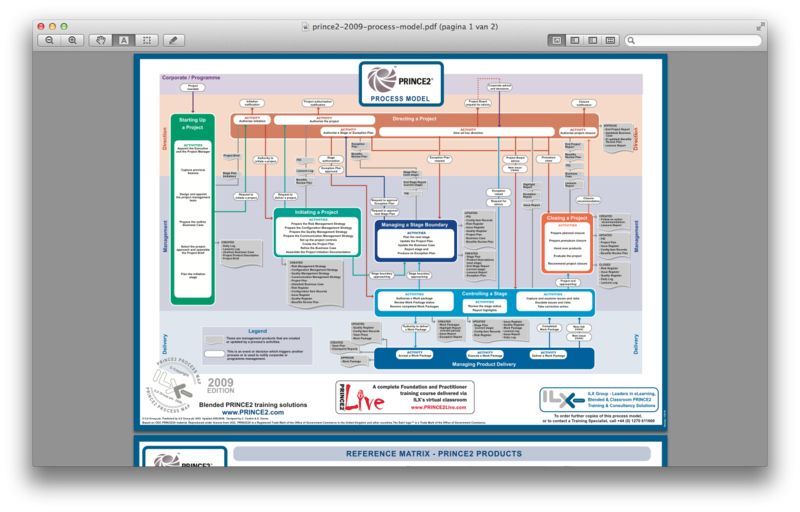 The PRINCE2 2009 PROCESS Model from ILX gives you an overview of all processes and activities. The flow between the processes includes the events. The flow between the activities is not mentioned; only a list of activities per process is given. Only the Managing Product Delivery process can raise new risks and issues and that’s not true of course. Documents are mentioned too but it’s not always clear when they are created, reviewed, updated etc. Not all documents are shown. Difference between baseline, records and reports is not clear. On a second page we see a reference matrix between all process activities and products. 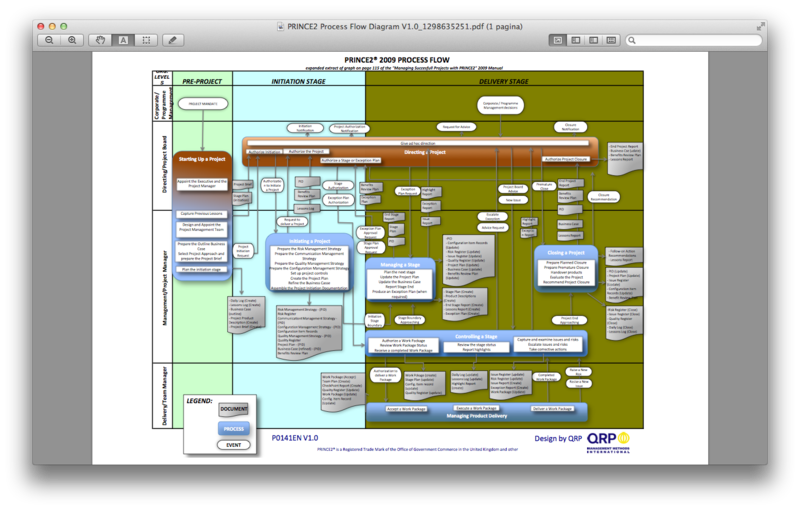 The PRINCE2 2009 PROCESS FLOW from QRP is more or less a copy from the previous one. Even my remark regarding the raise of issues and risks stays the same. I don’t know which one was developed first but I had more or less the same experience when I created the tabs for the PRINCE2 manual. In the layout they added the life cycle but in my opinion, it is over simplified, e.g. difference between subsequent delivery stage(s) and final delivery stage is not shown and you could run both Managing a Stage (word ‘Boundary’ is missing) and Closing a Project in the same stage. 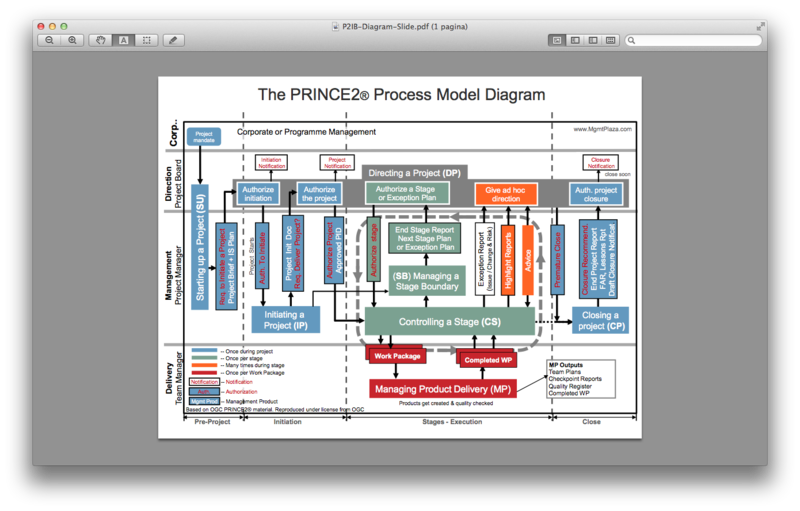 Nader Khorrami Rad offers the PRINCE2 Process Model in a simplified and a detailed version). The simplified version shows the processes, it’s activities including the sequence between the activities and the events between the processes. The picture also shows lists with principles and themes but no explanation. In a separate picture you can find the management levels and life cycle. Documents are not mentioned at all. Can be printed on A4. The detailed version shows the processes, it’s activities including the sequence between the activities and the events between the processes. For each activity you get the input and output documents too. The picture also shows lists with principles and themes but no explanation. In a separate picture you can find the management levels and life cycle. Also here the difference between baseline, records and reports is not mentioned. An additional matrix gives all activities, products, actions and RACI for all PRINCE2 roles. To read the overview it must be printed on A1 or A0 otherwise it will be very difficult to read. Frank Turtle gives three different pictures. 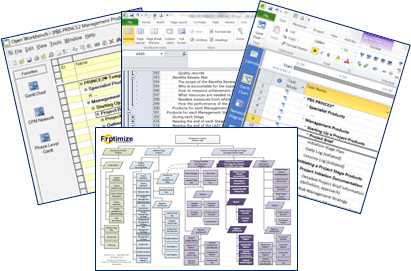 The PRINCE2 Management Products Map gives all products and when they are created or updated in the different life cycle stages. Relation with the different PRINCE2 processes is not always mentioned. Difference between baseline, records and reports is not mentioned. 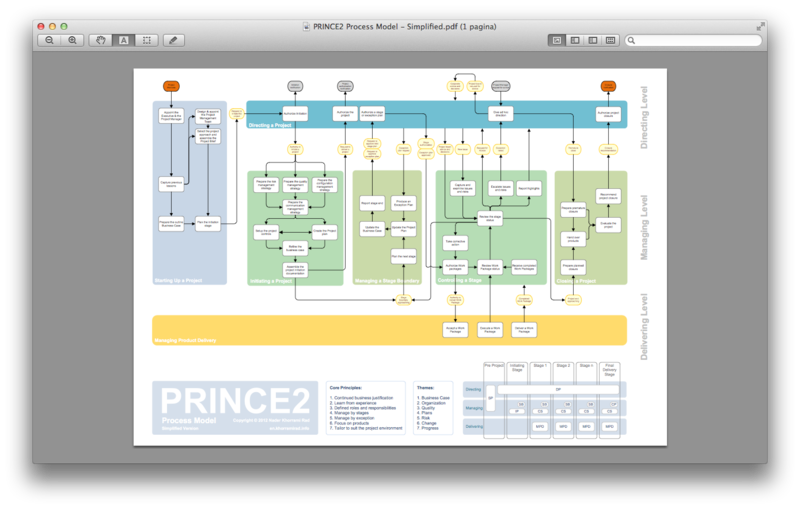 The PRINCE2 Process model Diagram gives the PRINCE2 processes, some activities, some management products, but it’s not clear when they are created or updated, some events or notifications. It looks like that Close is a separate stage (mentioned correctly in the Management Products map. I would say that even the combination of both pictures would not give you a complete overview. 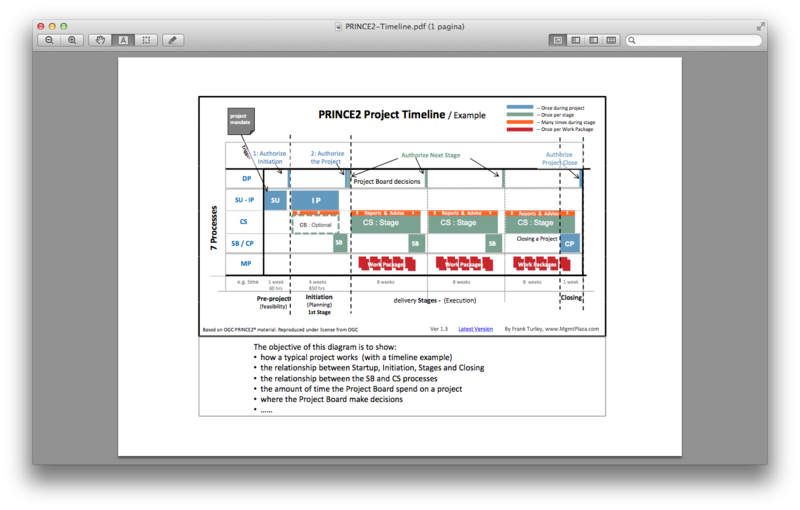 The PRINCE2 Project Timeline gives a nice picture of the project life cycle, the PRINCE2 processes, decision moments and an example of the duration of each stage. I would suggest mentioning the management layers at the left side instead of the processes. 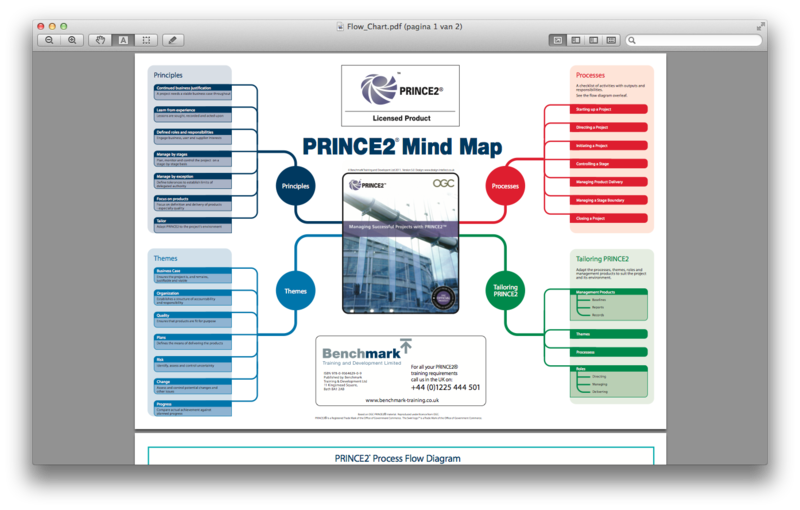 The PRINCE2 Mind Map from Benchmark.com gives an overview of Principles, Themes, Processes and Tailoring. No details, so the added value is low. 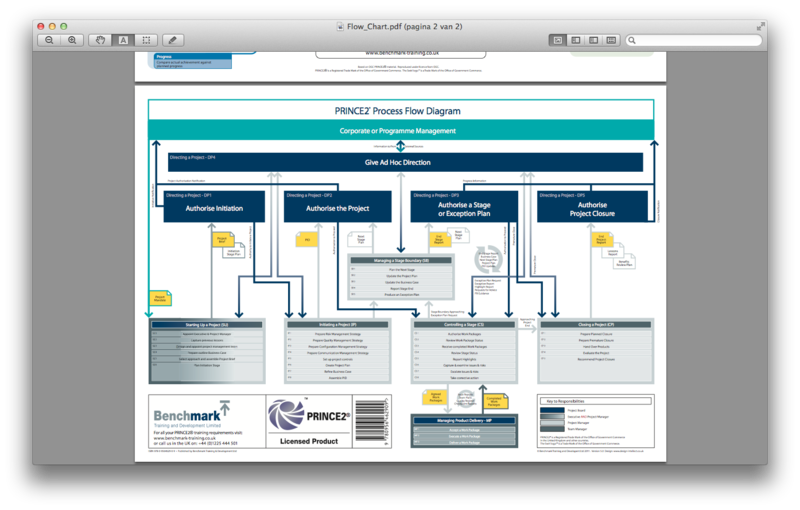 The PRINCE2 Process Flow Diagram from Benchmark.com gives all processes. Directing a Project is divided into the different activities including the right sequence. The other process’ activities are mentioned but no sequence is given. Only a few management products and the key to responsibilities are given. The last one I want to mention is my own PRINCE2 Quick Reference Card. It contains descriptions of all Principles, Themes including the relevant responsibilities, the Process Purposes, the Process Model, the Management Product Model including descriptions of all Baseline, Record and Report (Event and Time driven) management products and tailoring. It has been in use by many training organizations. See also PRINCE2 QRC. If you have other reference cards, please share them.